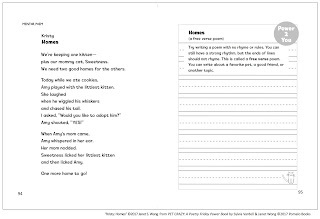 Howdy, Campers ~ Happy Poetry Friday! Link to PF is below. 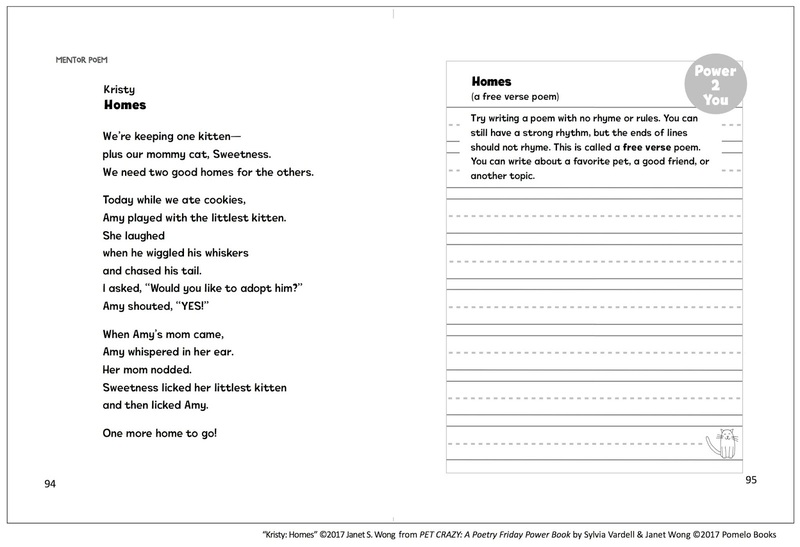 It was inspired by poems in The Poetry Friday Anthology® series. 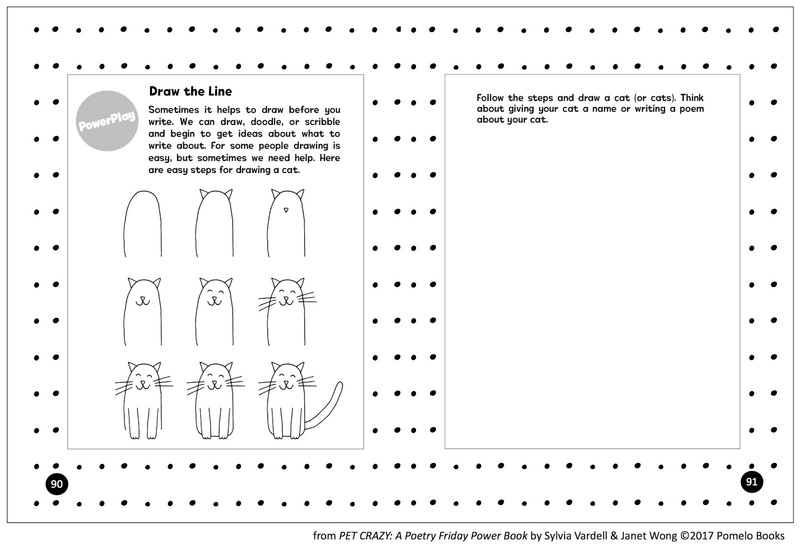 Five of these became “anchor poems” that form the core of PET CRAZY. Seven new poems were commissioned specifically for this book. 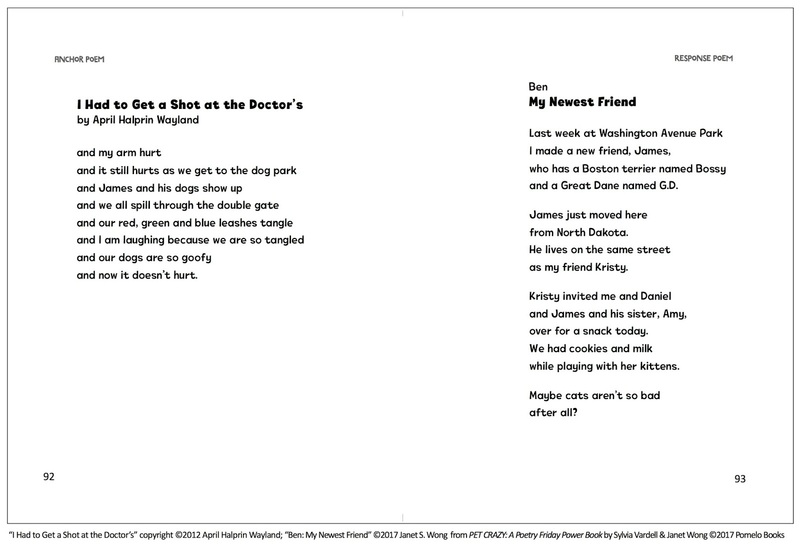 Then Janet took these 12 anchor poems and connected them with 24 poems (which she wrote) to create a story featuring three animal-loving kids. Congratulations, Janet and Sylvia for producing another imaginative, satisfying, useful book! To enter, use the Rafflecopter widget below. You may enter via 1, 2, or all 3 options. If you choose option 2, you MUST leave a comment on TODAY'S blog post below or on our TeachingAuthors Facebook page. If you haven't already "liked" our Facebook page, please do so today. In your comment, tell us what you'd do with this book if you win our giveaway--keep it for yourself or give it to a teacher or a young reader? Email subscribers: if you received this post via email, click on the Rafflecopter link at the end of this message to access the entry form. Note: if you submit your comments via email or Facebook, YOU MUST STILL ENTER THE DRAWING VIA THE WIDGET BELOW. The giveaway ends November 8th and is open to U.S. residents only. 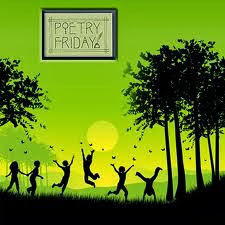 And don't forget that it's Poetry Friday! Thank you, Brenda, for hosting PF at Friendly Fairy Tales! 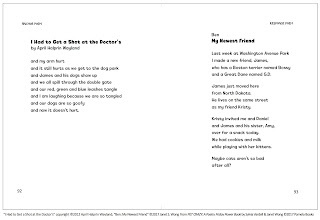 posted poetically by Eli, with help from April Halprin Wayland...and Snot, though Eli refuses to admit it. Looks like a wonderful addition to the series, April. I won't enter the contest because I am so far away that postage is problematic, but I did win an earlier installment of the series and will try to hunt down a way to order this here in Australia. I've enjoyed reading about this book every time it shows up. It looks like it knocks reading and writing poetry out of the ball park. Wonderful to see all those links, April. It is a book to enjoy, and in the classroom especially. Thanks for sharing so much! 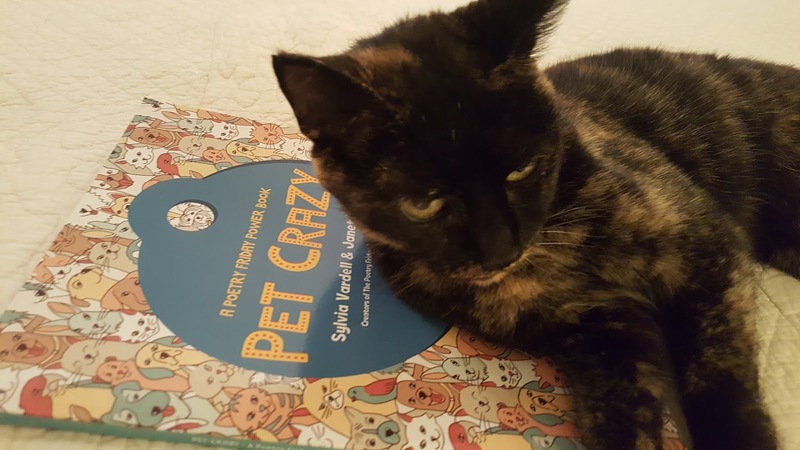 April, thanks for the review of Pet Crazy. Janet sent me copies to raffle off and one for me. I am enjoying the newest addition to the Poetry Friday books. Your review was inviting. Absolute Truth: As always, creators Janet Wong and Sylvia Vardell turn teaching on its ear. Thanks for giving me another glimpse at another Janet and Sylvia creation! Go Poetry! Thank you, April, for this thorough and thoughtful post! LOVE the way Eli is focusing on the poem. From his serious expression, I'm guessing that he's reading "Please, Mommy, Please?" by Janice Harrington and wondering why on earth anyone would NOT say yes to a dog! Love your pet-healing poem, April! Thanks for sharing this review. I have been hearing a lot about this book. I would love to share it with my granddaughter, a budding writer. Then I will donate it to her charter school. Thanks for the chance. 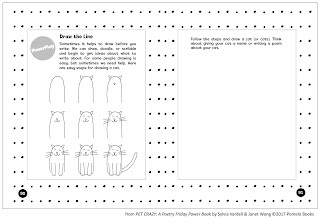 Well, I have not been paying attention, I guess--I knew about the concept of these participatory poetry books--had the chance to be in on early versions of *You Just Wait*, but I didn't realize *Pet Crazy* would be perfect for my classroom of 2nds. Looking forward to bringing it to them! Thank you for letting me know about this book. The contributors are amazing. I love learning all I can about poetry and creating it. I am so excited to read this book and put it to good use myself! What a great way to practice my writing and pass it on to others as well! Thanks so much for this fun post, April! Love all the links and tips you've incorporated. We're so happy PET CRAZY is getting such a lovely reception and we look forward to sharing it with more pet-loving, poetry-minded readers! I’m new to teaching second grade this year after years in third. 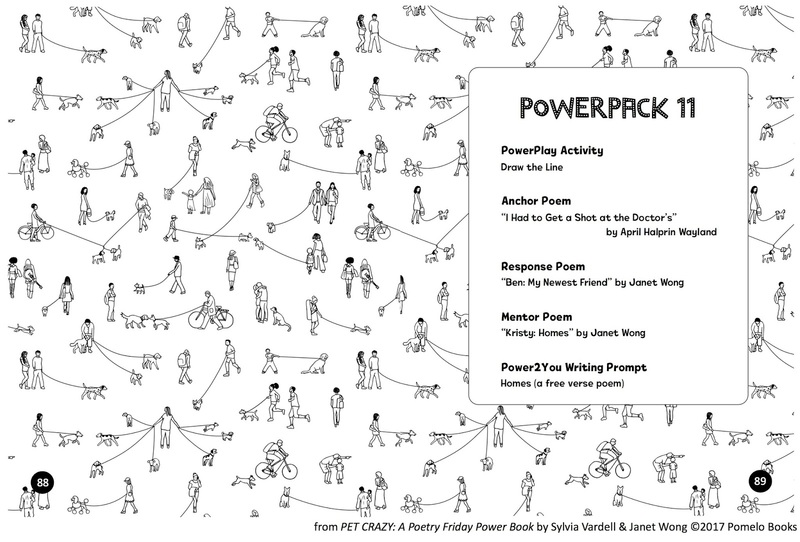 This looks like a wonderful resource to use as I explore poetry with my kiddos! Thanks Eli, I'd love to win a copy of Pet Crazy. Please enter my name in the draw. Thanks, have a great weekend! I have been teaching a long time and know that young students love their pets and love to write about their pets. This book would be such a welcome addition to my classroom. Congrats on being included, April. Eli is a handsome guy, but I bet Snot would never agree! I love that name. I won't put in for the give away since I already had the honor of winning this wonderful book. It's such fun seeing the genius of Sylvia and Janet. Pets make an always uncertain life bearable for kids, and adults! Yay for you (and Eli), April! I can't wait to read this latest POETRY FRIDAY edition. Sally ~ I hope you do track it down in Oz! Carol ~ Lucky Kidlitosphere--yet another Pet Crazy raffle! Rosi ~ G'luck to you and your granddaughter! Karen ~ a wonderful resource indeed! Carl ~ Eli says g'luck! 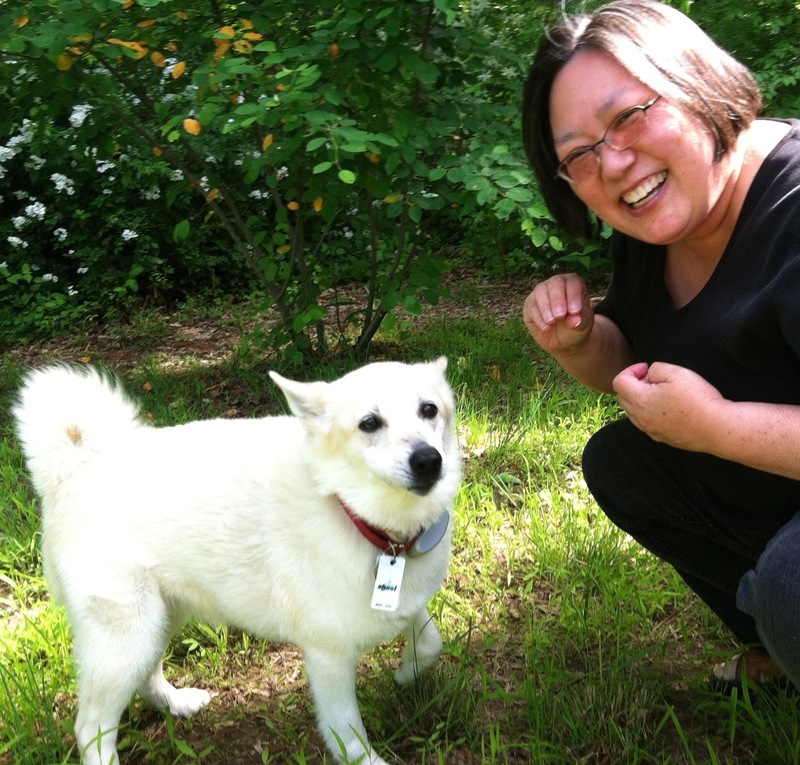 Margaret ~ I love the photo of you and your dog! Brenda ~ you're right--Snot has her own opinion about Eli and trust me, it's not pretty. 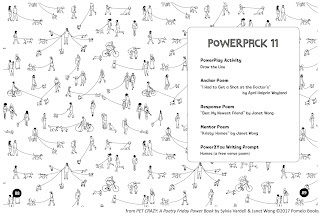 April, this book is a great resource...I'm trying to teach my 9 yr old writing granddaughter (she's constantly writing and making books) the joy of poetry too. And she's an animal lover (actually terms herself a dog-whisperer!). It would be a great guide for her. Thanks for the giveaway and post. Damon ~ a 9-year-old writer of books and dog-whisperer is probably already a poet, whether she's aware of it or not...which as Grandpa you know. G'luck to both of you! 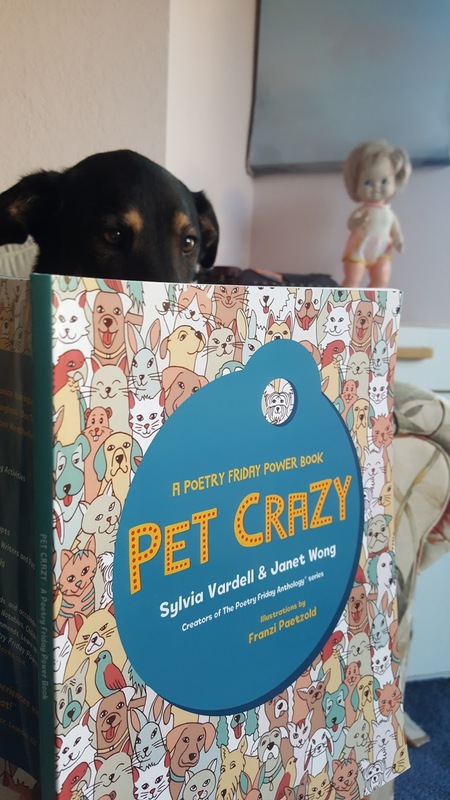 Each time Sylvia Vardell and Janet Wong come out with a new Poetry Friday Power Book, I jump at the opportunity to review it. That's because I believe so strongly in what they are accomplishing with these fun DIY poetry journals—slipping poetry into children's lives (at home and in the classroom) in a way that not only entertains, but helps young people explore their surroundings, think about themselves in relation to others, and express themselves through the power of words. Willie Mays and Giselle ~ I ABSOLUTELY agree!